This New York hotel offers free shuttle service to the airport and the rail or bus station. 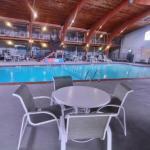 There is an on-site restaurant and indoor heated pool. Just a 10-minute drive from Plattsburgh International Airport, it provides free Wi-Fi in every room. Best Western Plus the Inn at Smithfield is equipped with a 24-hour gym. Guests can also enjoy the game room. A microwave, fridge and coffee maker are included in the spacious, contemporary rooms. There is a work area along with cable TV. The 99 Pub and Restaurant at Inn at Smithfield Best Western Plus offers American cuisine in a casual atmosphere. Cumberland Bay State Park, Lake Champlain and the Plattsburgh Amtrak are within a 10-minute drive of the hotel..
We plan to add more related stuff like: pet friendly hotels in Plattsburgh, New York dog friendly hotels in Plattsburgh, dog parks in Plattsburgh, pet stores in Plattsburgh, NY, and pet spas in Plattsburgh. Keep checking for more!